"Samuel Adams (1722-1803) was an American patriot, statesman, and political leader from Boston, Massachusetts. Samuel Adams, born September 15th, 1722, was the son of Captain Samuel Adams, a Boston brewer, who was a wise man and a good citizen. Having been enriched by his trade, Captain Adams was enabled to give his son the best education which the colony afforded. At that time, in Massachusetts, when a man sent his son to college, he generally did so with a view to his entering the ministry; and this was the case with the father of Samuel Adams. But the youth having been drawn away from theology by the superior charms of politics, he disappointed his father, and chose another career. While he was in college the events occurred which first drew his attention to the great loss and inconvenience which the American colonies suffered from their connection with Great Britain. He maintained that it was lawful, and he enforced his opinion with something of the boldness of later years. Upon leaving college, he entered the counting-house of a merchant; but it soon appeared that ho had no talent for business, and he was continually drawn away from his desk by the keen taste he already had for political discussion. Consequently, he soon abandoned the pursuit chosen for him, and his father lent him a thousand pounds to set up in business for himself. He was as unfortunate in promoting his own fortunes as he had been inefficient in the affairs of another. He trusted a friend to the value of one-half his capital, and this friend, soon after, meeting with misfortunes, he never demanded the debt. Other losses followed, which left him penniless. He now joined his father in the management of the brewery, and he remained thenceforth a brewer as long as he had any business at all. The great occupation of this man's life was politics, and he devoted himself to the affairs of the public with far more zeal and energy than men usually infuse into their own business. We have never had in America a more consistent and hearty republican than he. From this remark, the reader can judge something of the spirit of the man, and in that spirit he lived and labored from his twenty-first to his eighty-second year. After holding such small offices as selectman, school-visitor, and tax-gatherer, we find him elected a member of the Legislature of Massachusetts, to which body he was annually re-elected, from 1765 to the period of the Revolution. It is difficult, in the compass of a single article, to convey to the reader's mind any adequate idea of the services rendered by this man in preparing the way for a successful resistance to the tyranny of the English king. We may approximate the truth, perhaps, by saying that he was to the independence of his country what Wendell Phillips has been, [in the 1850s], to the abolition of slavery. 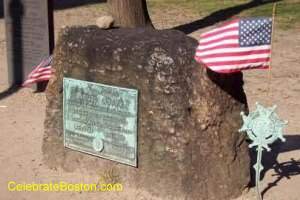 On that memorable occasion, in 1770, when the people of Boston solemnly determined that the two regiments of British troops should be removed from the town, Samuel Adams was their spokesman. The acting governor of the colony was in the Council Chamber with twenty-eight Councilors, the Senate of the Colony, seated at the board. By the side of the governor was the lieutenant-colonel in command of the royal troops. Into this room came Samuel Adams, at the head of a committee of the people of Boston, who communicated to the governor the unchangeable resolution of the citizens, that the troops must be withdrawn. A statue in front of Faneuil Hall depict Samuel Adams confronting Governor Hutchinson. At that time the whole property of this illustrious patriot was the house in which he lived, and a little land about it, and his whole income was ninety pounds a year, which was the amount of his salary as clerk to the Assembly. When he had wrought up the people to the point of sending representatives to a general congress, he himself was one of its members, and he continued to serve his country during the Revolution with all the zeal and energy which had marked his conduct in his native State. When the war was done, and his country was free, he went home to Boston and had not a place to lay his head. His house had been ravaged and plundered by the British troops, and it was with very great difficulty that he gathered together the requisite articles of household furniture. Sometime after, however, the premature death of his son, Dr. Adams, put him in possession of a competent estate. During the last years of his life, when the conflict raged between the Federalists and Republicans, he espoused the Republican side, which exposed him to so much obloquy, that it was with great difficulty that he was elected to so unimportant an office as lieutenant-governor of the State. Finally, he was elected to the governorship, and even received a few votes in 1796 for the presidency. When Mr. Jefferson came into power, in 1801, that great man wrote a most beautiful and touching letter to the Republican patriarch, recognizing his great services, and assuring him that the chief of the Democratic party was fully alive to their value. He died in October, 1803, aged eighty-two years. Party spirit ran so high in Boston at that time, and the Republicans were so odious, that it was with considerable difficulty that his friends could induce the authorities of the State to pay to his remains the funeral honors usually accorded to those who have held high office. Boston, a city which many persons suppose to be dangerously infected with what are called "radical ideas," [was], in reality, one of the most "conservative" communities in the world. In fact, all communities are conservative. It is only individuals who are radical, although sometimes, for short periods, great men of that stamp rule the communities to which they belong, and in which they are generally hated or feared.